Hey! What d'ya know? No Es!! 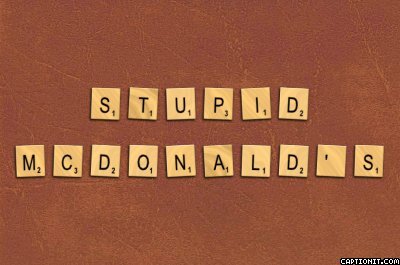 Major faux pas on the part of McDonald's Singapore marketing department that certain deserve the firing of every single one of them in that office. So the Chinese New Year just around the corner that they are pushing a Doraemon plush toy promotion (Happy Meal?) where the cute robot kitty is dressed up in the costume of the 12 Chinese zodiac animals. Well 11 to be exact as they yanked the robot cat in pig costume to take Muslim sensitivity into consideration. Here's what gotten my nut sack all twisted and knotted. From a commercial point of view, how is selling an incomplete set going to work? Seriously, it is like selling a Scrabble set but the E letters are missing. (You can still spell other words what? Like cats, work, mortician what. No need the E lah! The robot cat in pig costume was taken out so as not to offend the Muslims but have they considered the feelings of the Chinese by offering an incomplete set? If this country is "regardless of race, language or religion", then why is one bending over to make way for another? On this token, we may as well ban beef on their menus since many Buddhist and all Hindus do not take beef. I seriously don't get this paranoid overreaction. It is after all just a plush toy. A ROBOT CAT IN A PIG COSTUME!! How on earth is that going to be offensive to our Muslim brothers??!! Are we to ban celebration of Chinese New Year every 12 years just because it's the year of the robot cat in pig costume? We are in a country where we live together in harmony but surely as much as we respect the Muslim faith, our Muslim brothers would just as happy to respect our Chinese beliefs? ARE WE NOT ON A TWO-WAY STREET HERE? going by their logic, they should have removed the dog toy too if they don't want to offend our Muslim neighbours because dogs are regarded as being 'ritually unclean' by most practicing Muslims. that is why they are stupig mah!!! seriously its a cat in a pig costume why take it so seriously? Mistress Grace: It is not like the "pig" is being shoved down the people's throats. I mean if it is something that you don't want. Don't buy lor. I think it would be a better idea to offer the full set of 12 and then offer an additional cupid during the week where they released the "pig" so as to offer an alternative? if i'm not wrong, they only hv 2, 3 pple in the mktg dept here in SG - a mgr & her execs. so basically, the decision prob took place just betw 2 pple - the mgr & her boss. there u go. that's why we hv an incomplete set. lu: Welcome to the blog. I think it is a case of misplaced paranoia that backfired big time. I supposed their intention was good but they certainly did not think things through. Common sense would have told you to just carry on the campaign i.e. include the pig and don't make a big deal out of it. I would dare say that no one would even notice anything amiss.